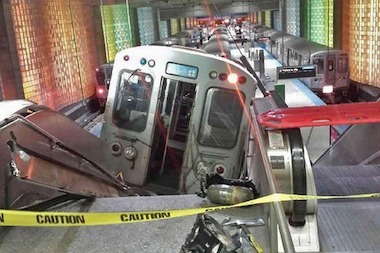 O'HARE INTERNATIONAL AIRPORT — The operator of a CTA Blue Line "L" train that crashed at O'Hare Airport, injuring 35 people, was so tired it appeared she nodded off while operating the train and "wasn't as coherent as she should have been," a union official said Monday. Robert Kelly, president of Amalgamated Transit Union Local 308, said the operator at the controls of the early morning train, who has not been identified, appeared to have dozed off before the train raced partially up an escalator at the airport train station. "She indicated that she had worked some overtime, more than usual, and that she was very tired," said Kelly, who spoke with her before she was being treated for a leg injury. "Obviously she didn't do this intentionally, but when a person doesn't remember much and says they're tired you assume things are happening — she wasn't as coherent as she should've been." Kelly said the driver also submitted to drug and alcohol tests, which is standard procedure. He said there will be further interviews Tuesday. "We will sit down with her and get her to be more open and tell us what happened," Kelly said. "It was a scary thing to see. ... If this would've happened three hours later I have no doubt there would've been multiple fatalities." Tim DePaepe, of the National Transportation Safety Board, said earlier Monday that investigators also plan to speak with the operator. He said event recorders will be matched together to come up with the speed of the train as it came through the station and crashed. Investigators will also look at video footage taken by cameras in the station, and one on the front of the train. "We have not examined the video yet so I can't speak to what's on the video," he said. The train is being secured so it's safe to examine — and won't be moved Monday. "The train is not going to go anywhere for the foreseeable future," he said. "The train is not going anywhere today." 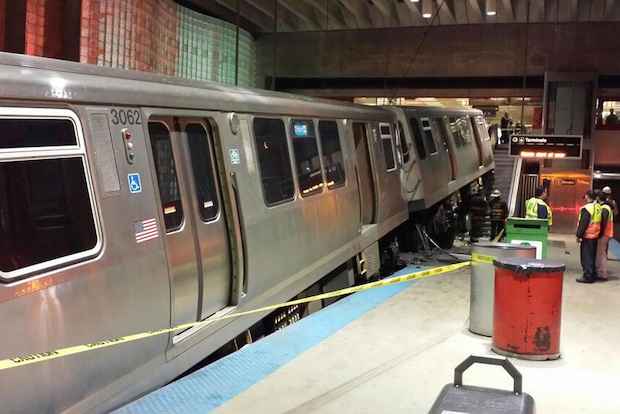 Thirty-five people were injured in the incident, which occurred at 2:52 a.m. at the O'Hare Blue Line Station. The operator had been working since 8:40 p.m. Sunday night, the NTSB said. "We know what happened, but we don't know why it happened," said Larry Langford, a Chicago Fire Department spokesman. "The train didn't stop, ran out of track and went up the stairs." Twenty of those injured in the crash — including the operator — were taken to Resurrection Hospital, authorities said. Seven were taken to Swedish Covenant Hospital and six to Lutheran General Hospital, while two people refused medical attention. authorities said. Six of the people were seriously injured, though none of the injuries is life-threatening, Langford said. Mayor Rahm Emanuel said he spoke with CTA President Forrest Claypool Monday morning and the CTA boss "is on this." "To everybody who was obviously on the station or on the platform, our thoughts are with you," Emanuel said. "If there is any good news when you have an accident is that nobody was seriously injured, but we have a lot of work to do to get to the bottom of it." CTA spokesman Brian Steele said: "Thankfully, this incident occurred when we have some of the lowest ridership on the train." At an early morning press conference, Steele said the station is equipped with a "bumping post" at the end of the line that is designed absorb shock and help stop a train that fails to stop in time. "Typically what happens is the train will stop short of that," he said. "This train did not do that, and apparently was traveling at a rate of speed that clearly was higher than a normal train would be." There were no early indications of any mechanical issues with the train, he said. "We will be looking at everything related to this. We will be looking at equipment. We will be looking at signals. We will be looking at the human factor," Steele said. Investigators are talking to the train's driver, examining satellite data and looking at video to determine the cause of the crash, Steele said. Kelly said the union doesn't "anticipate problems with the drug and alcohol tests." Steele said it was unknown when service would resume at the station. CTA shuttle buses are running between the Rosemont and O'Hare stations until the station reopens. At O'Hare, CTA employees and police directed passengers to the airport's bus and shuttle center one floor up from the CTA station. About 10,000 people ride the Blue Line to O'Hare daily, according to a CTA report published last April. The CTA has such plans in place whenever service is disrupted at any of its "L" stations, Steele said. The sight of the shuttered train station with the train rolled up onto the escalator caught many people flying into O'Hare by surprise Monday morning. "I've been on a flight all night from San Diego, and I just want to go home," 30-year-old Larkin Romaneski of Wrigleyville said. "Part of this is jet lag, but part of it is seeing a train on an escalator."